I have to start by conceding that Strafe is actually the first procedural perma-death “roguelike” that I’ve ever played. My frame of reference is therefore the genuine classic shooters, Unreal and Quake II, that present the player with a long and winding campaign to work through. Those games give you ample opportunity to save your progress should you die, so that death is only the end of a single level at worst and barely a few seconds if you’re hot on the quicksave button. 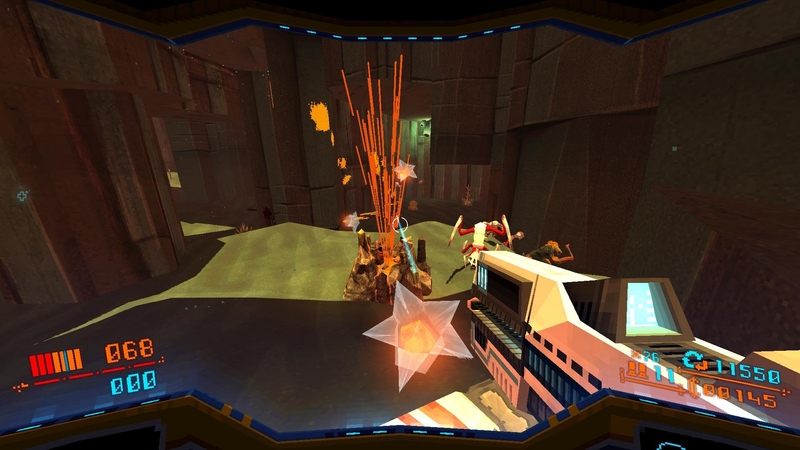 Strafe, though it aims to continue the shooting traditions, has a completely different structure. Death is the end of any given playthrough, so when you finally win a level it is a genuinely unbroken chain of life from the start of the game to the end — rather than the chopped up and replayed chain of life in a more narrative-driven outing, where time is constantly rewound until you get it right. 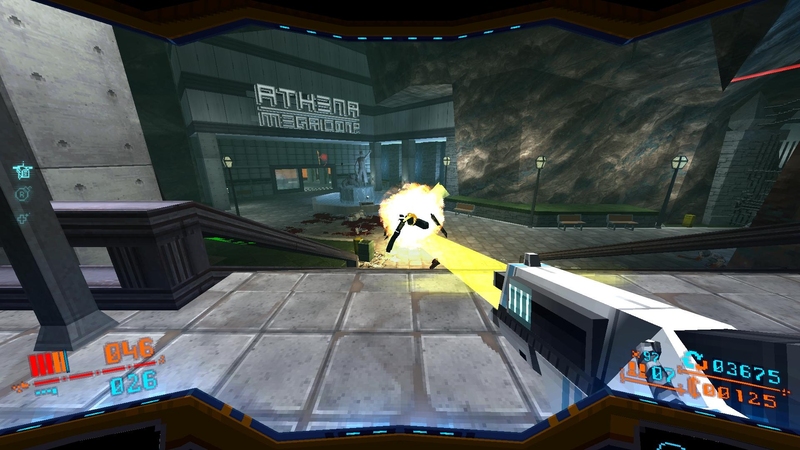 At the start of the game you are given the choice of a single main weapon. The choice is between machine gun, shotgun and railgun; surprisingly, I’ve had most success with the railgun. Although I idolise precision of mouselook I’m often not particularly good at it, so the railgun’s slower rate of fire but instant hit and pinpoint accuracy should be a dangerous combination. However, the machinegun is too innaccurate and it’s all too easy to run out of bullets, while the shotgun is utterly useless at even medium range. And you do need to be very comfortable with your main weapon, as it’s the one you’ll spend most of your time using. While alternative weapons can be found scattered across the levels, they generally contain one clip’s worth of ammunition and no refills (short of finding the exact same weapon again), so these are mostly momentary diversions. Bonus weapons don’t even have their alt fire modes. 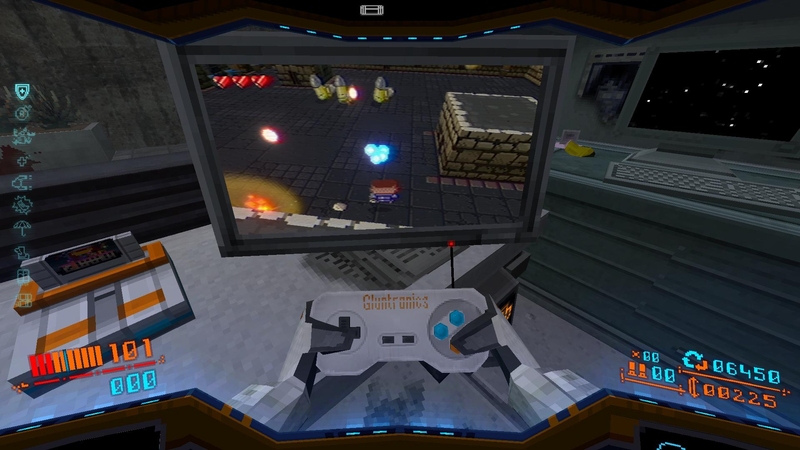 This is sadly one of many ways in which Strafe seems to squander its opportunities. The idea behind having a varied weapon set is to switch between them based on your favourite weighed against the scarcity of ammunition or situational advantages; whereas with Strafe, you pick your favourite at the start and that’s pretty much it for the next hour or two of your playthrough. Similarly, the flow of combat is very consistent. Enemies generally come in floods, pouring out of secret wall compartments ahead of you (and, sigh, behind you) as you enter new chambers. Most enemies are melee attackers that rush you, bolstered by a few ranged characters that launch slow-moving projectiles to dodge while you’re at it. The problem is that that’s kind of it; enemies are not particularly interesting and the permanent high action mass of enemies removes the spikiness that would otherwise make things memorable. Yes, backpedalling and dodging gets the pulse racing and is fun of itself, but when it’s the only thing there are very few stand-out moments of triumph (or hilarious failure). The railgun upgrade that makes it look and feel stronger actually trades stopping power for bouncing beams (and also frequently bugs out on entering a new level). This feeling interests me because I could play Unreal Tournament over and over and over and even after fifteen-odd years it doesn’t have that samey feel at all, so I’m not sure why Strafe falls into this trap. Maybe the procedural levels don’t help, because there aren’t particularly many modules in each zone and there are only four zones. A good campaign run in Strafe is going to last about two hours, but as I’m writing this I have yet failed to reach the final level (though that’s been three times now because of game-ending bugs rather than completely my own ineptitude) — you’re meant to batter through the whole game time and time again, replayability is the core point of the roguelikelike experience. The Black Canyon is the only outdoor zone in the game, which is a refreshing change of pace, but in the spirit of Quake II it’s still brown. Contrast that with a hand-crafted save-and-load campaign, where you’d spend roughly equal amounts of time working through each level. When a challenge stops you in your tracks, you don’t have to repeatedly slog through the earlier parts to try it again; you just pick up from your last save point and repeat a much smaller area. Retries refine your knowledge of the problematic area, thus making it memorable over the long term, but the quicker turn-around means it’s also soon left behind in favour of something genuinely new. Contrast again to Unreal Tournament‘s bewildering bounty of maps, all spread across hugely varied environments. They might not change within themselves in practically endless combinations, but there are enough of them that you’re just not repeating the same situation very often — and with its more generous selection of weapons and more complex enemy behaviour, there are still plenty of different ways for combat encounters to play out even within fixed levels. There are some incredibly irritating enemies, such as these bullet-sponge volcanos that emit homing missiles, which can be shot down but still splash acid blood all over the level. 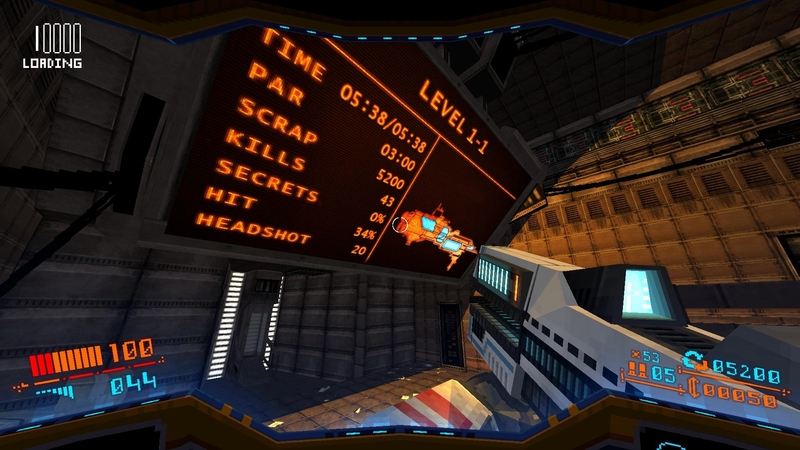 It’s more disappointing because on a basic level Strafe is visually extremely vibrant and detailed. The spaceship pre-run configuration area is beautifully laid out, full of striking little decorations. Most enemies can have any one of their limbs shot off, while robots explode in showers of metal shards and junk that remains lying around after the event. It has embraced the ability of modern computing power not to give us the same in higher fidelity, but to simply put more stuff in the world. The problem is that while there is a lot of concentrated detail in special places, there is not a lot in the main level modules — so just imagine what the game could have been like if it swapped procedural generation for a traditional hand-crafted campaign? 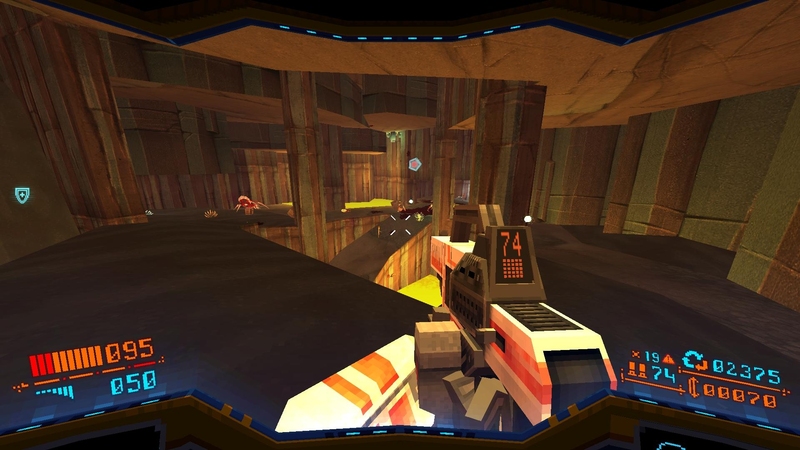 There are a couple of genuine game-within-game secrets locked inside Strafe. It’s technically really impressive and delightful but I’d rather they spent that art and implementation effort sprucing up the actual game. So, yeah, I’m both digging and not digging it. I mean, the moment to moment action is fun, the shooting is pretty satisfying and there are some amusing secrets scattered through the game (though maybe not as amusing as the effort it takes to unlock them); it’s just extremely stingy with doling out the moment-to-moment fun stuff. Weapon variations are too rare, weapon pick-ups are too rare, enemies are too samey; for a game that one is meant to replay over and over and over, there simply isn’t enough stuff to keep that interesting over a sustained period of time. I want to like Strafe, I just can’t quite do it. The foundations are fantastic and to me the flaws lie only in the way they’re pieced together — but perhaps that’s not necessarily a problem with Strafe, so much as a problem with the roguelike genre conventions it has adopted simply not being to my taste. Ah well, it was worth a try. 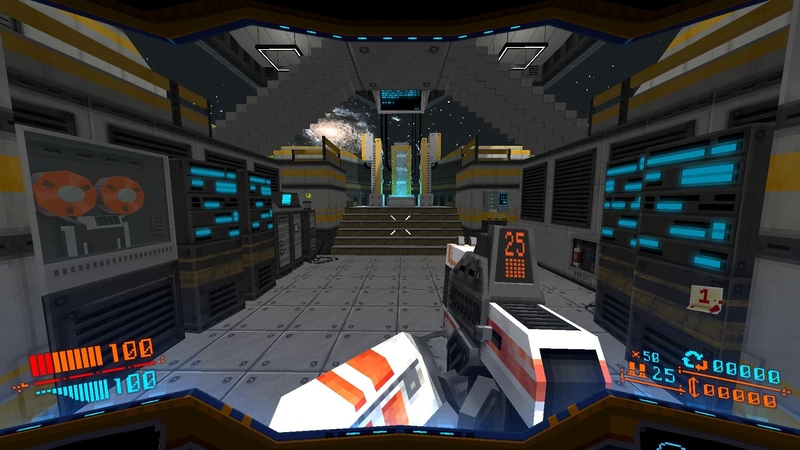 This entry was posted in Gaming and tagged first-person shooter, FPS, permadeath, Pixel Titans, procedurally generated, Strafe by Rao Dao Zao. Bookmark the permalink.